On-board web-based IDE with full-featured debugger gives you the best programming experience possible. 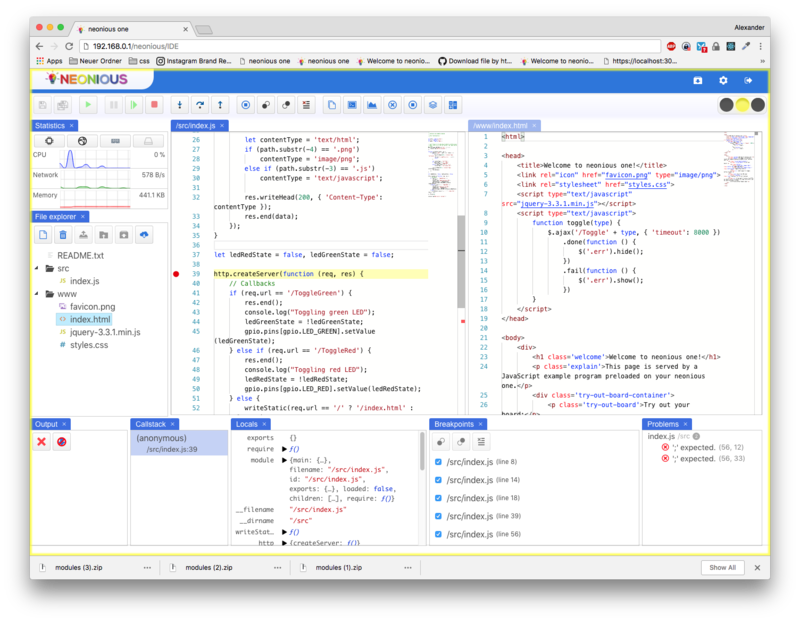 IDE also features a graphical package manager for npm, allowing you to tap into the largest software registery in the world. Only few secs boot time (no Linux), fast byte code execution. Energy-efficient CPU. Low energy usage. 27 I/O pins, 11 of these pins usable as ADC (provided by accurate LPC822, not ESP32), 2 pins are 20 mA 5 V-tolerant open drain pins, 2 pins usable as touch sensor. 23 pins can be used freely for SPI, I2C or UART! 58 mm x 27 mm (2.28 inch x 1.06 inch), tightest posible design with chips mounted on top and bottom. Breadboard compatible! 240 Mhz, 4 MB RAM, 4 MB Flash dedicated to your application, with all files being compressed on the fly. System + IDE use separate dedicated CPU core, RAM and Flash. Click "Run" and / or enable auto-run on power-up for long-term fun! You now have your web server serving your static pages up and running! Allowing your website to control motors or output sensor data is now only a matter of a few additional lines of code. Allowing neonious one to serve gigabytes of static data is now only a matter of connecting a $ 2 SD card breakout board and an SD card to your neonious one, and adding two additional lines of code. Develop from any PC, with all amenities you are used to from great development software! We give you many pins to connect your electronics, and thanks to the LPC822 switch matrix, you can choose the pins quite freely. neonious one provides the Node.JS API which brings its event-driven, non blocking I/O model to the embedded world. You can now write large embedded projects without having to think about realtime operating systems, synchronisation issues and deadlocks. Use ES 6 modules, let, async/await, classes, typed array, you name it. ES 6 features are supported seamlesssly. For larger projects you might even want to use TypeScript, supported seamlessly on neonious one, to get rid of programming errors by introducing static typing. Well, thank you! Buy the neonious one in our store now!